The Crosstour CR700 is one of the most affordable dash cams on the market. 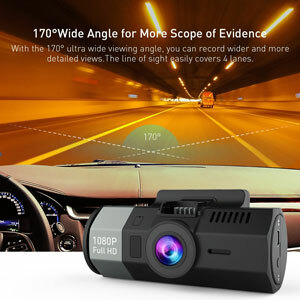 Cheaper than the CR500, but with many of the same advanced features, this car camera video recorder films in 1080p high definition, capturing still and moving images in excellent quality. Loop recording, a wide-angle lens, and a 2-inch LCD menu screen allows you to record in incredible detail while enjoying the highest quality and most practical features. The CR700 is significantly cheaper than many other dash cameras on the market, but still excellent quality. It’s clever, economical with space, and super reliable. So what’s the spec like? Record everything on the road, including up to 4 lanes of traffic. The 6 layers of fixed-focus lens capture all the details you need in 1080p high definition. Fantastic night vision means clearer footage in all kinds of conditions. As soon as your engine starts, the Crosstour CR700 starts loop recording. This automatically deletes footage of no use and keeps your memory card clear for the next recording. If an accident occurs, the gravity sensor will automatically protect the footage from being deleted during loop recording. The CR700 will kick into life on its own, so you can concentrate on the road. The camera will start recording automatically if movement is detected within 3 metres, protecting you against theft and damage. If the object or person stops moving within 10 seconds, the recording ends to save space and energy. What’s the Crosstour CR700 like? Reviewers are overwhelmingly impressed with the quality of the CR700, even on the most overcast days. It’s easy to set up, records even the widest of motorways, and ideal for people dash cam veterans as well as newbies who don’t want to splash out just yet. Attaching the CR700 to your windscreen is simple enough, but some have had difficulties with the quality of the mount. It might loosen over time, making it difficult to keep your camera pointing in the right direction. Some have also found the gravity sensor to be too sensitive, locking footage of normal road use as well as potential accidents. Should I buy the Crosstour CR700? Despite some gripes about build quality, most are thrilled with the CR700’s features and high definition recording quality. It’s got everything you need at half the price of many other dash cams on the market. Previous articleDashcam Insurance Discounts – Who offers them?